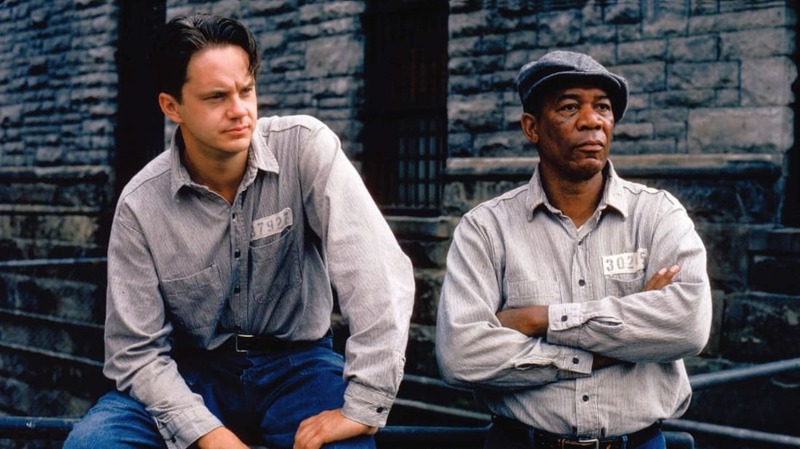 You know Red and Andy, but did you know The Shawshank Redemption was probably the smartest dollar writer-director Frank Darabont ever spent? Here are 15 things you might not know about the Oscar-nominated prison drama. 1. IT'S BASED ON A STEPHEN KING NOVELLA. The film is based on Stephen King’s novella Rita Hayworth and Shawshank Redemption, which was published in his 1982 short story collection, Different Seasons. Two other short stories in the collection were made into films: 1986's Stand By Me and 1998's Apt Pupil. 2. IT HAS A CONNECTION TO TOLSTOY. King’s novella shares several plot points with a nine-page short story written by Leo Tolstoy called “God Sees the Truth, But Waits.” Both are about men sent to prison for murders they didn’t commit. 3. DARABONT GOT A GOOD DEAL ON THE RIGHTS TO KING'S STORY. He bought the rights from King for $1. 4. THE PRODUCTION COMPANY THAT MADE THE FILM HAS A NOD TO KING IN ITS NAME. Castle Rock Entertainment, the production company that made The Shawshank Redemption, was co-founded by Stand By Me director Rob Reiner and is named after the mythical Maine town that provides the setting for many of King’s books. After director Frank Darabont pitched The Shawshank Redemption to Castle Rock, Reiner originally offered $2.5 million for the script to star Tom Cruise as Andy Dufresne and Harrison Ford as Red. 5. DARABONT WROTE THE SCRIPT IN EIGHT WEEKS. He decided to drop the “Rita Hayworth” part of the novella because actresses sent their resumes in for consideration thinking it was a Rita Hayworth biopic. During the casting process, Darabont even received a call from an agent who represented a supermodel; he swore the script was the best she had ever read and that she’d be perfect for the (nonexistent) part of Hayworth. 6. OHIO STOOD IN FOR MAINE. Although the film is set in Maine, the Ohio State Reformatory in Mansfield, Ohio stood in for Shawshank Prison. The structure was slated to be torn down, but the production delayed its demolition for a year. After the film wrapped, all the buildings in the complex were torn down except the cellblock and main administrative building, which were preserved for historical purposes. 7. MORGAN FREEMAN PLAYED CATCH FOR NINE HOURS STRAIGHT. The scene where Andy first approaches Red about the rock hammer as Red plays catch in the main yard took nine hours to shoot. Freeman continued to play catch for the whole nine hours without complaining and showed up the next day with his arm in a sling. 8. GOODFELLAS INSPIRED THE FILM'S STYLE. Darabont says his main source of inspiration was Martin Scorsese’s Goodfellas because of its use of voiceover narration and editing techniques. 9. FREEMAN RECORDED HIS VOICEOVER BEFORE ANY FILM WAS SHOT. Originally, all of Morgan Freeman’s voiceover was recorded before any of the film was shot. The fact that much of it syncs up to the onscreen action (see the scene on the roof where the inmates drink beer) isn’t simple editing; Darabont would play back the recorded voiceover on set during each take for the actors to specifically play off of the audio. But the audio quality of his voiceover was too poor to include in the movie due to tape hiss, so Freeman had to re-record the entire voiceover in post-production. 10. SHOOTING TIM ROBBINS IN THE RAIN WAS NO EASY TASK. Every take of the film’s signature shot of Tim Robbins raising his arms outstretched in the rain after Andy breaks out of prison was out of focus except the one in the film. It was the final take. 11. THE PROPERTY MASTER CONTRIBUTED TO THE NARRATIVE. The visual joke of Andy’s rock hammer being tucked into the Bible right after the first page of the Book of Exodus came from the film’s property master, Tom Shaw. 12. DARABONT'S HANDS AND FEET MAKE A CAMEO. The hands and feet in the close-up shots of Andy do not belong to Tim Robbins; they’re Darabont's. 13. RED IS SUPPOSED TO BE A MIDDLE-AGED IRISHMAN. In the original novella, Red is described as a middle-aged Irishman. 14. THE MUG SHOT OF YOUNG RED ISN'T MORGAN FREEMAN. The young man in the photo is actually Freeman's son. 15. The tree where Red finds Andy’s letter isn’t in Buxton, Maine. It’s in Ohio’s Malabar Farm State Park.